Could It Be Helpful To Focus On Your Mistakes? Do you have a tendency to focus on your mistakes? To notice the 5% of your presentation that wasn’t as good as it could be? To really remember and mentally grind over the times when your work was mediocre or even a bit rubbish? When I was keen on challenging such ‘dysfunctional thoughts’, I would give myself a pep talk about it, ‘Now Rachel, this is ‘all-or-nothing’ thinking. Just because you didn’t handle that question from the audience well, doesn’t mean it was terrible. Let’s remember what went well’. It was like Mary Poppins lived inside my head. She meant well but she kind of irritated me. Do you know the voice I mean? The one that tries to help you think more positively? When I discovered ACT, I started to respond differently to these thoughts. Instead of trying to change them, I worked on noticing them with curiosity. Have you tried that approach? What did you notice? Perhaps you tend to be hardest on yourself when your behaviour doesn’t align with your values. You might also notice which feelings turn up when you don’t do as well as you had hoped – shame, guilt, embarrassment, disappointment? What urges do you get when these thoughts and feelings turn up? Do you feel like you want to give up or do you want to try to do better next time? This curiosity about your thoughts, feelings and impulses can be very useful. It makes it easier to become more flexible in responding to your thoughts and feelings and this can improve performance. This curiosity might help you to notice those times when focussing on mistakes disheartens you and other times when it actually motivates you to improve. When you are trying a new behaviour and you are worried that you won’t ever succeed then a self-critical stance can be de-motivating. Which is okay if the activity doesn’t relate to what is important to you. 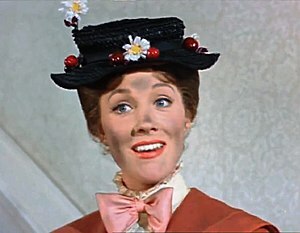 But if it does matter to you, if it is a move towards what you want your life to be about, then letting Mary Poppins give you a motivational pep talk might be helpful. ‘You can do it! Everyone messes up when they are starting out! This is really important to you. Keep going and you will get better at this. What is one small action you could take today that would move you forwards?‘ Note: The pep talk is best if it is realistic, links to your values and focusses on taking action. Telling yourself you are doing wonderfully and are destined for stardom can be problematic. You aren’t trying to get rid of the painful thoughts – that tends to be self-defeating. However, if you notice that the self-critical thoughts encourage you to try harder then a different approach may be useful. If you are highly motivated to achieve mastery at a behaviour and over time you have been becoming better with practice, then you may find it useful to focus on your mistakes. Focussing on the places where you have done poorly and working out how to improve are an important part of becoming an expert. Really focussing on the mistake and working on improving your performance. It is all about psychological flexibility! Say to the “voice”: “I willing to hear you” and notice what happens then. Ask “the voice” “are you willing to tell me what you feelconcerned about and afraid of?”. Thanks Maarten, I like that a lot too.